Well let's see,..... to start off,I went back through the previous month's picks and am always impressed with the dedication and skills of many owners.The transformations of some of these vehicles is truly remarkable. My automotive life started on motorcycles and soon led to the need for the extra set of wheels.That or I would probably be dead! So sports cars it was.As best a I can recall it goes as such:MGB,'61Alfa Milano rag,Healy 104 w/289,TR 250 w/wanker overdrive(sungears,Churchill tool # bah bah SoCalli prolly is familiar),Ford Cortina that I use to go off road with,Morgan 4+4,Spitfire w/a cranked up 1600 stripped for speed,Alfa GTV6 ,a '68 Chevy Stepside w/HP 327 and finally as I got older and jobs took on more importance along with buying a house,getting married, things got pretty boring. A couple of Ford vans,in there was a great little '68 Volvo wagon with a 'Bug Spray' setup and Koni suspension.The usual run of Toyota pickup,S10 etc. It was the S10 that always got stuck on flat wet ground that use to drive me nuts,so I started looking for an AWD or 4x4. I had noticed the AWD badges on Astro and had remembered test driving an early cargo that had the floor shifter.That van really impressed me with it's getup and go. 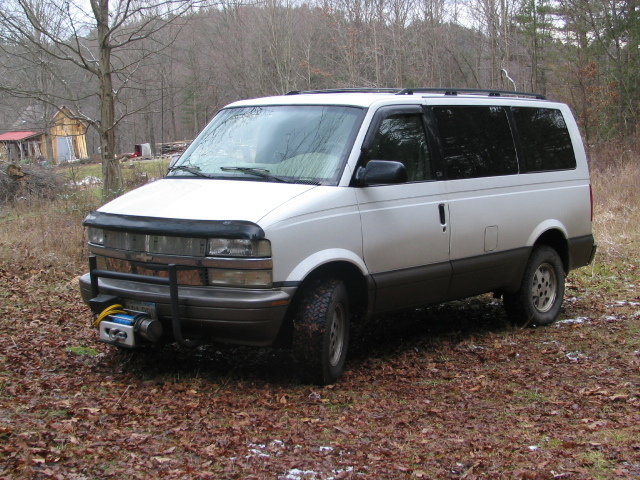 I also had always liked the idea of being able to lock stuff up and not have to deal with rain or frozen weather on tools etc.The Astro's size was good and so I had a friend take me to an auto auction in Framingham,Ma.I found my van there the first trip there.A one owner clean soccer mom unit. So, I now am very impressed with my ability to drive my vehicle w/utility trailer onto the lower 40, where my brush/burn pile is located. This is great,.. I don't get stuck anymore!! Sooooo, I start to wonder if I can put a snowplow on this puppy. I was a little familiar with lightweight plows I had seen at the Big Box stores and asked a friend that had one how well it worked. He said it was great,but I still wasn't sure it could be done.I then punched in [Astro snowplow] on the search engine and up can Dean Harper's van and the rest is history. Dean basically was Dean and told me what I needed to do and informed me about the forum.I joined and was invited to NECO 2005 (Watkins Glen) campout. I again was really starting to see that this vehicle could be more than just 'a van'. I have always liked clean looking vehicles.I like it to be different, but also like people to have to figure out what makes it different. 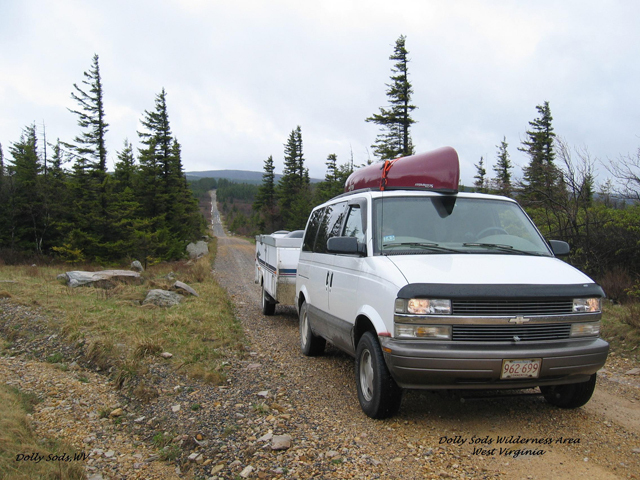 The debadging,slightly larger tires and 3" lift sets this van apart from stock without drawing direct attention. This vehicle has been all I could hope for and more. Along with the knowledge available from this forum and friends met,I won't be driving anything different soon. The other thing is this is my daily driver.So it needs to do all thing equally well. As a neighbor of mine, that has worked at NAPA for over forty years and owns more than a few muscle cars,says,"Your van has stature,that's a good lookin' rig"